New contractor of Zenit Arena, Metrostroi, is carrying out tests of Russia’s first retractable roof. The operation was launched on Monday, when the northern half of the roof was moved just 50 milimeters towards the center of the venue. This allowed evaluation of all engines. After preparations, on Tuesday further work followed. The half-dome was moving 1 – 1.5 meters at a time, then monitored for potential issues. By the evening it was in its final place, closing part of the roof. Yesterday similar preparations began with the other half, which will be fully closed tomorrow in the afternoon. While the first closing operation lasts 5 days, eventually it’s expected to take only 15 minutes ahead of events to close or open the roof. Zenit Arena’s retractable roof was structurally finished in March, but covering it with translucent film ended now, in September. The two steel petals are installed over 70 meters above the field, while the immense stadium’s total height will reach 110 meters (including spires holding the roof). Official deadline for completion of the stadium is still set at late 2016, though it’s been rumoured that further delays can be expected. 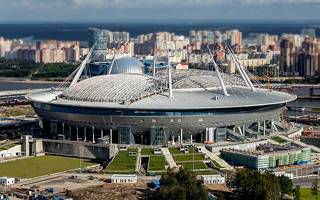 Once complete, the building will host Zenit Saint Petersburg on a weekly basis and has already won hosting rights for the 2018 World Cup and Euro 2020.